The Shredding Event is happening Wednesday, November 16 for 1.5 hours at each campus! 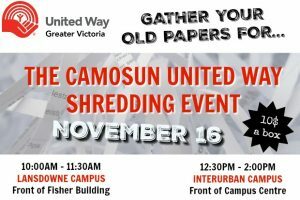 Start gathering your old papers to bring for shredding at either campus. $10 donation per box. ACCESS, the company that Camosun uses to shred its confidential materials, will have a truck on campus. 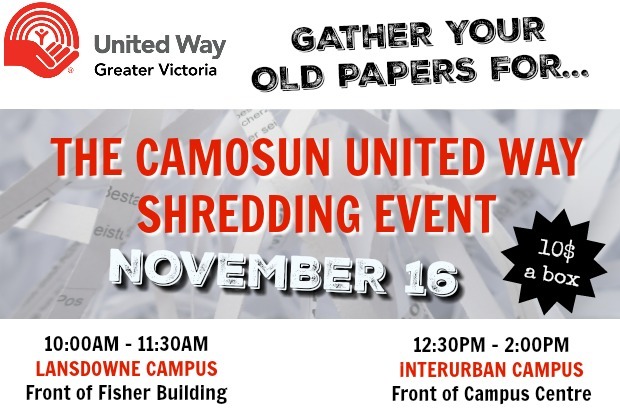 Bring your paper materials/documents that you need to be dealt with in a confidential manner and have them shredded here while you support the United Way.